The Tecbor Firewall Board is a rigid panel for fire protection composed by Magnesium Oxide, Silicates and other additives finished on both sides by a fiberglass mesh, which gives it a greater mechanical resistance. 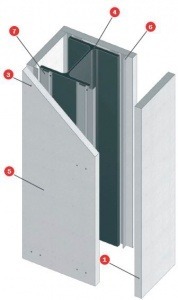 The Technical Department of Mercor Tecresa have developed and tested multiple solutions commonly used in construction such as metal structure protection, partitions, false ceilings, overlays, ventilation and extraction ducts, as well as specific solutions for sectorization in Curtain wall facades or Multitude of tests in tunnels. – Its reaction to fire: The Tecbor panel is classified as a A1 (fireproof) while the PYL, FOC type, have a Fire Reaction rated as A2 s1 d0, which means that it has a lower importance on the contribution to fire and “s1” means that it emits smoke in case of fire. This is because these types carry cellulose. – Mechanical Resistance: Tecbor panels have much better behavior than the PYL plates in terms of flexion, perpendicular traction to the fiber and compression. – Simplicity of Assembly: Tecbor Panel systems are always much simpler to assemble and are tested with the usual profile. The rest of systems with PYL boards are usually composed of several boards, which means an extra cost in labor and often it have special profiles to withstand fire resistance tests. – Lightness of the system: this is a great advantage in terms of both installation and weight overload for bearing structures. For example, an independent False Ceiling system EI-120 with Tecbor Boards weighs about 20 Kg / m2 whereas a system of Plasterboard does not fall below 48 Kg / m2 (more than the double). It could be an overloading problem for the structure when making a reform with an existing support structure which is adjusted to the calculated loads. – Reduce thicknesses: It is important to note that our systems are the ones that occupy a smaller space when making fire protection for metal structures. Nowadays, it is very important because of the scarcity of m2 in construction. In some cases when it is made a fire protection for metal structures with Plaster Boards, it is necessary to leave air chambers between the board and the metal up to 30 cm in order to validate the test. – Better Thermal and acoustic performance: at equal thickness, the Tecbor board has a better thermal and acoustic behavior than the rest of PYL boards, as evidenced in the need to place two or three PYL boards to replace a Tecbor one in order to perform the same Isolation and Integrity “EI”. For example, in order to achieve sixty minutes of fire resistance, a 10 mm Tecbor board is equivalent to 15 mm of PYL. – Stability against moisture and steam: The Tecbor panel does not deform in contact with moisture or water, unlike with PYL panels foc type. They are also inert to the appearance of mold and mildew such as it occurs in drywall. As we discussed in an article about fire resistance testing, it is very important to read carefully how the fire resistance tests and their field of application are carried out since it is not used well or not according to the tested system.